NickChange is a Messenger Plus! 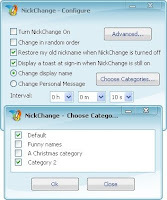 Live script that allows you to change your name automatically every seconds. You need to have Messenger Plus! Live plugin insalled on your computer in order to use this script. - Choose more then one category to mix them!